An insight into the digital transformation of the Daily Telegraph when Mark Skipworth, executive editor of the Daily and Sunday Telegraph gives the University’s Harris Lecture. A discussion about how newspapers can best make use of their archives in the digital age with a presentation by Patrick Fleming, head of reader and reference services at the British Library. He has been the driving force behind its newspaper strategy which has already seen digitization of more than three million pages of searchable content from national and regional newspapers. Patrick has edited three regional daily newspapers at Bournemouth, Southampton and Oxford and worked extensively in digital media. The Guardian blogs editor Kevin Anderson on lessons learned from the social media coverage of the UK presidential election. With a UK election lurking somewhere on the political horizon it should be an informative and useful session. Eric Ulkin, former Los Angeles Times online editor, will talk about building the LA Times datadesk and alternative forms of story building. The day includes lunch and a networking reception before the Journalism Leaders Forum in the evening with BBC Business Editor Robert Peston joining the panel for a discussion entitled: ‘The Bottom Line: Is the business of journalism affecting the journalism of business?" Other panellists are FT.com interactive editor Kate Mackenzie, Crain’s Manchester Business publisher Arthur Porter, TheBusinessDesk.com editor, (North West) Chris Barry. The Guardian’s Kevin Anderson will chair the discussion. 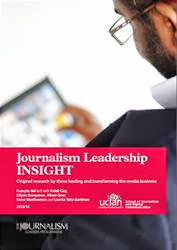 The Digital Editors’ Network is a free event run in conjunction with the Journalism Leaders’ Programme of the School of Journalism, Media and Communication at UCLAN. To book your place and to get full details of the event please email Nick Turner nturner@cngroup.co.uk.